Natalia Tikhonova "Not a Word about the War." A total of 87 artists from 36 countries have taken part in the main project of the Fifth Moscow International Biennale for Young Art, which opened at the Trekhgornaya Factory on July 1. The main project of the Fifth Moscow International Biennale for Young Art opened at the Trekhgornaya Factory on July 1. Traditionally open to interpretations, its concept – “Deep Inside” – is the brainchild of young British curator Nadim Samman, who selected 87 artists from more than 2,000 applications. One of the main criteria for the event is the age limit – the artists must be under 35 years old. This year, the curator himself is approaching this limit – he is now 33. According to Samman, the Biennale's goal is to search for new voices in art. But the philosophical curatorial manifesto he produced is not supported by fresh artistic ideas, and visually, if not conceptually, is more in the spirit of Italian arte povera – the Biennale's budget was only about 350,000 euros ($385,000). "Young artists have long stopped being brave and audacious, they do not open up new territories, but develop those already occupied by their predecessors, who violated and pushed all the possible boundaries of art," reputed art historian and critic Olga Kabanova told RBTH at the Biennale. The Brazilian artist was awarded a grant from the international jury for her work at the Biennale. This multi-figured composition of colored clay refers to choreographic sketches by Edgar Degas but also serves as a kind of series of self-portraits of Leite, which impress with their fresh plastic language. The Moscow/Paris-based photographer and artist, who has previously exhibited both in Russia and abroad, has created an installation out of evacuation plans for gigantic Soviet institutions printed on canvas. The meditative geometric schemes of exits from the buildings cause anxiety and are seen as harbingers of panic. The author also draws analogies between the schematics and Suprematist compositions by avant-garde artists and constructs the installation by analogy with the 1915 legendary exhibition 0.10, which first exhibited Kazimir Malevich's Black Square. The artist from Yakutia works with the ethnic motifs and mythology of the peoples of the Russian north. Her installation, while apparently embodying a surreal spirit, is in fact devoted to shamans and Yakut totem poles – sergeh. Each of them is a sculpture of metal and colored glass, embodying spirits, different worlds, life and death. Davide Quayola, extract from Pleasant Places, 2015 from POSTmatter on Vimeo. This four-channel video installation is dedicated to Van Gogh – Quayola shot landscapes in the same village in Provence where the great post-impressionist once lived. It seems you can watch the looped video forever: Trees, bending in the wind, from an ordinary realistic shooting gradually begin to crumble into pixels, as if changing the style of this painting in motion. The artist, a follower of Moscow conceptualism, has come up with and visualized the story of a sect of “sphere believers” who lived in Kronstadt (an island city in the Gulf of Finland just west of St. Petersburg) in the late 1960s. In her total installation, Pravda recreates the room of the founder of the sect, Vera Pavlova, who once, while exploring a factory yard, came across a sphere whose function was unclear, and in which "she saw a symbol of unity." This installation about the properties of memory was presented last year at the Moscow Museum of Modern Art. 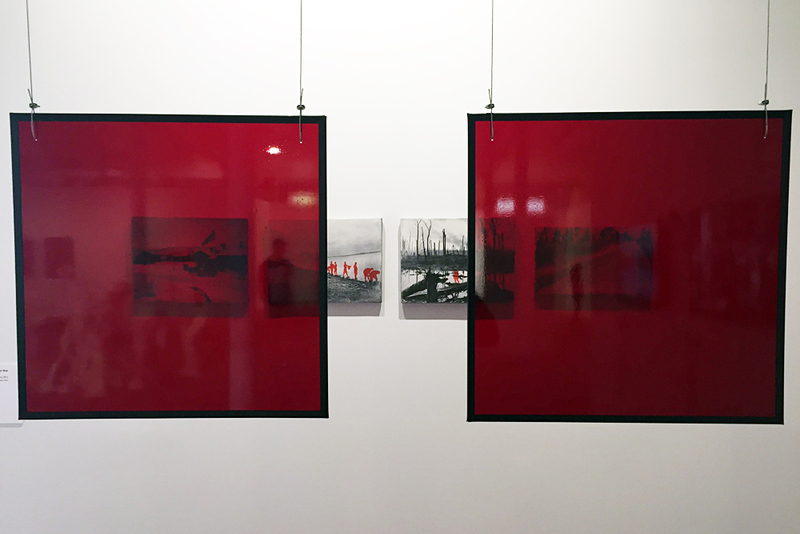 In a series of black-and-white landscape photographs, placed on a wall of light boxes, the artist has painted scenes from the life of soldiers and traces of war in red paint, which gives the prints a bloody, dramatic effect. In front of the photographs there are two red filters – if you look through them, all the figures "disappear" from the frames.